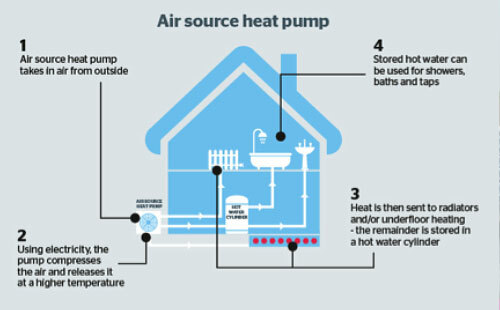 An air source heat pump (ASHP) absorbs heat from outside air at low temperature into a fluid, then boosts it to a higher temperature by passing the fluid through a compressor, and transfers its higher temperature heat to the heating and hot water circuits of the house. The pump needs some electricity to run, but it should use less electrical energy than the heat it produces. Alternatively you could consider using solar photovoltaic panels or a wind turbine (if you are in a suitable area) for a greener source of electricity. There are two main types of ASHP systems. To heat water in your home.